Taco lovers, this week's for you. I'm going to showcase making fresh carnitas tacos from scratch. By Saturday, I'll have made slow-cooked carnitas, guacamole and corn salsa garnishes and a side of refried black beans (plus a drink or two to go along with it). Today we're starting with the shell. Sure you can buy corn tortillas, but they are rarely any good. The name-brand ones on the shelf in the aisle are loaded with preservatives but lacking in flavor. The ones from the refrigerator case are better, although I often find they fall apart easily. If you are blessed with access to a Mexican market that makes them fresh, that's probably a great place to get to them. But otherwise, why not just make them yourself? The ingredients are really simple. The recipe is really simple. 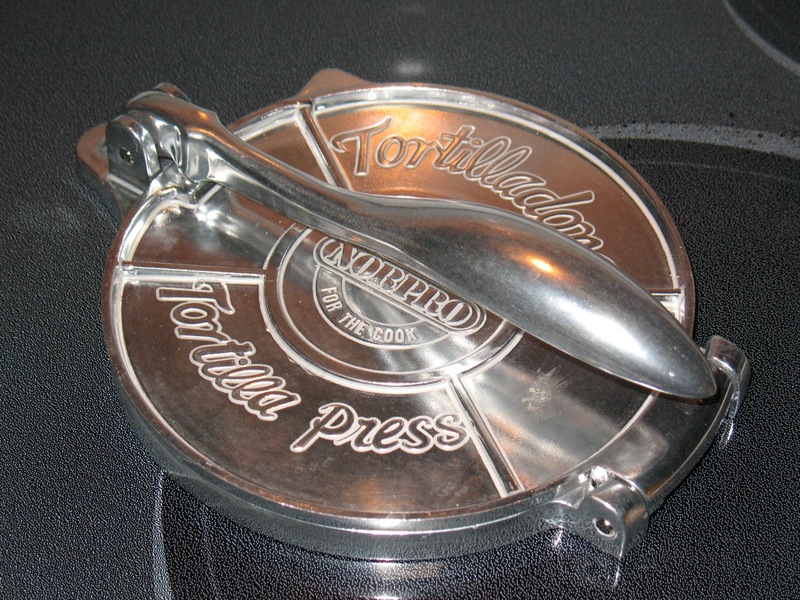 The only thing that's at all complicated is having the right equipment--a tortilla press. If you try to make them without it, I doubt you'll think this is easy. I can see rolling them out becoming a major hassle. But a tortilla press is easily acquired (I got mine from Amazon) and doesn't take up much room in your equipment cupboard. If you like Mexican food, it's worth it. 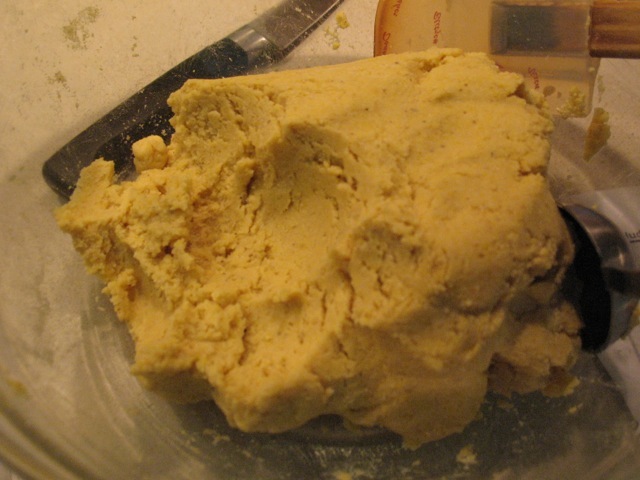 The dough should be about the consistency of playdough. If it's too crumbly, add a little water or, if too sticky, a little more masa. I found masa harina at Whole Foods and in the Latin foods aisle at Giant. It's ground, dried hominy, which is corn treated with lime (the chemical compound, not the green fruit). If the first few you make don't try out quite right, keep trying and you'll get the hang of it. I found that making the dough balls a little smaller helped. Also, when placing the dough on the tortilla press, put it off center a little toward the hinge, since the pressing motion will push the dough away from the hinge. If you put it directly in the center, it tends to squeeze out along the opposite edge (the handle side). Lining the tortilla press with two sheets of a cut Ziplock bag makes getting the dough off the press a snap. 1. Combine masa and salt in a large bowl. Stir in the water and knead until dough forms. It should be firm and springy and even slightly dry, but not crumbly (adjust by adding more masa or water as needed). 2. Heat a large skillet over medium-high heat (if it's a nonstick skillet, you don't need to brush it with oil). Cut a quart-size Ziplock bag along the edges to make two sheets of plastic big enough to cover both sides of the tortilla press. 3. Roll a heaping tbsp. of dough into a ball (should be just larger than an inch, about the size of a golf ball). 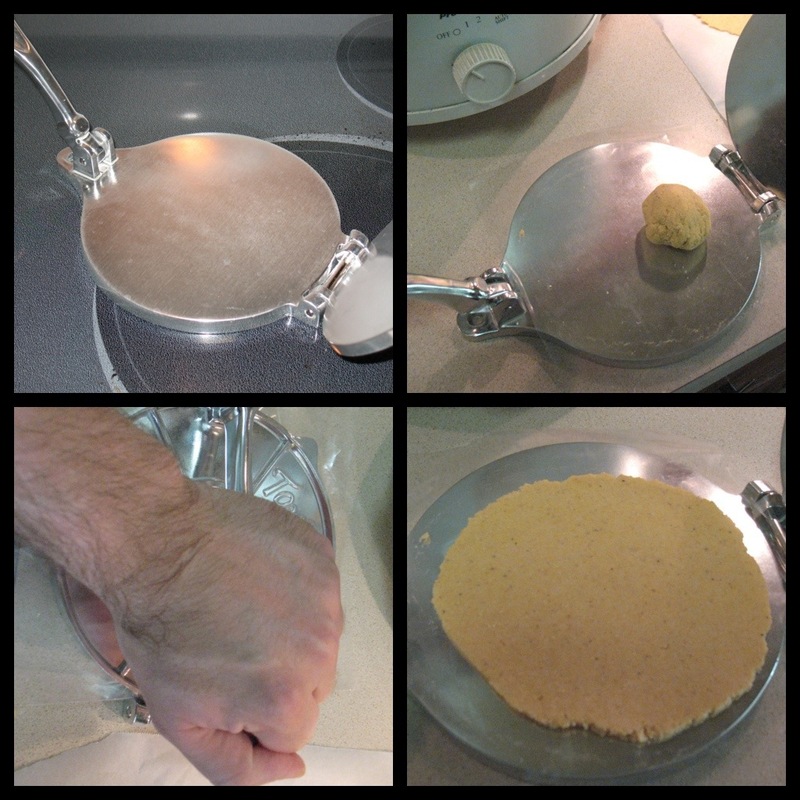 Lay a sheet of plastic on the bottom side of the open tortilla press. Place the ball of dough on top, just slightly off center toward the hinge, put the other piece of plastic on top. 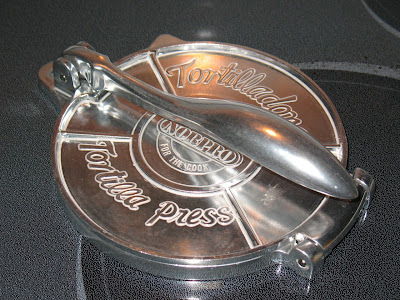 Close the press and use the handle to press down, flattening the tortilla (don't press too hard or it will be too thin). 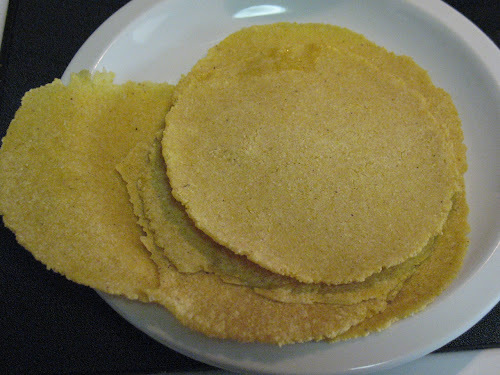 Carefully remove plastic and set formed tortilla on a piece of parchment lightly dusted with masa. When two or three are formed, place in the warm pan. Cook for about 90 seconds, then turn over, cooking another 15-20 seconds. Remove from pan and cover to keep warm. Repeat process, working in batches until all the dough is used up. I'm so glad you made your own tortillas for our taco feast. They really made a difference. I also appreciate how nicely you explain how to prepare these. I'm sure home cooks will find it helpful. Nice job, as always.